Tips versus service charges - which do you prefer? 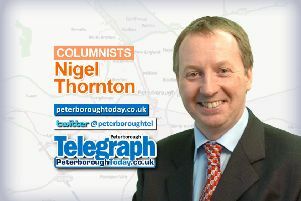 In this month’s column I’d like to start by welcoming a new independent restaurant to Peterborough – The Chubby Castor. February is well and truly here and that classic late-winter chill has settled on Britain once again. New Year already feels like a lifetime ago. After the hectic Christmas and a squeeze on your wallet that we all feel during January, you may only just be starting to think of that first night out of the year with friends or family – a lovely meal after getting through all those leftovers. Maybe after watching your pennies for the last month, you’re more aware of the little charges and methods that restaurants utilise and wonder what they’re for or you’re noticing more concise menus? Well, look no further as I thought I’d offer some insight for those who have always questioned these things. Some restaurants and big chains make use of service charges. It’s a hotly debated topic in the food industry. These restaurants usually do it because it is seen as being easier to control tips and ensure everyone receives them. However, in some cases they have been used to prop up wages for staff. At Prévost we don’t use service charges on day-to- day bookings as we pay our entire front of house staff at least the national living wage or above; and have moved toward minimum fixed hourly contracts – rather than zero hour contracts. We want our staff to receive tips for what they are – a sign of thanks from our customers for their hard work and service – instead of relying on them to make a decent wage. One thing that we do at Prévost, which you will see a number of independent restaurants doing, is take details of a credit card when you make a booking and sometimes take a deposit payment as well. This is because every customer counts at smaller restaurants with a limited number of tables (we have 34 covers at Prévost) and taking these details helps stop ‘no-shows’ who make a booking, then decide not to come at the last minute and don’t make us aware. These occurrences can cost restaurants hundreds each week in lost revenue, and that really adds up for small restaurants. One of the other, more tangible, things you may have noticed over the past year has been the move to smaller, more concise menus or set menus. There are a number of reasons for this and it may be as simple as the restaurant wanting to do it out of personal choice. However, for many restaurants the cost of food is increasing by the month and sometimes the difference in just 12 months is staggering. Just as we sometimes fret and strain over our household food bills, chefs do the very same. They’re trying to be creative and adventurous with less choice – sometimes with great results! The restaurant industry is always changing and adapting, it has to in order to survive – so perhaps some of the things covered here won’t be done in five years, and new methods, techniques and styles will have taken over, time will tell!